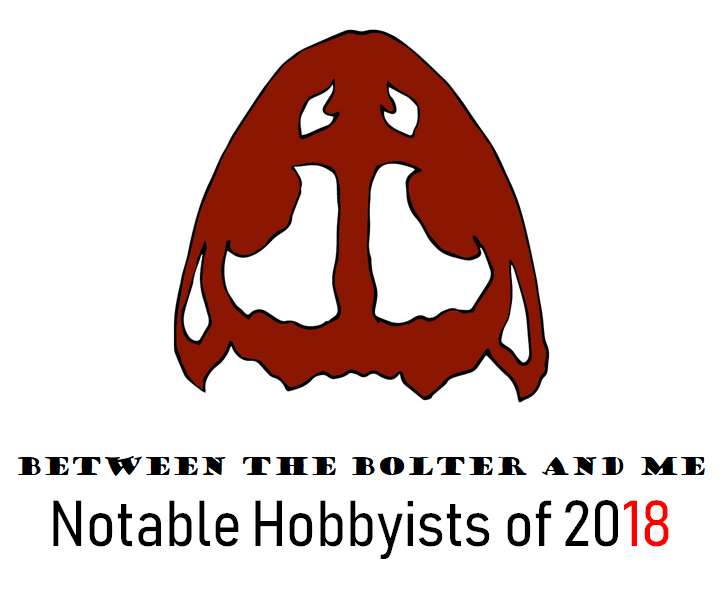 Having reviewed our favorite models of the year, and looked back at our own work on Between the Bolter and Me from 2018, it is finally time for our last annual recap post, highlighting some of our favorite hobbyists of 2018! Like each year before it, it seemed like the quality of work put out by the community was the best it has ever been. 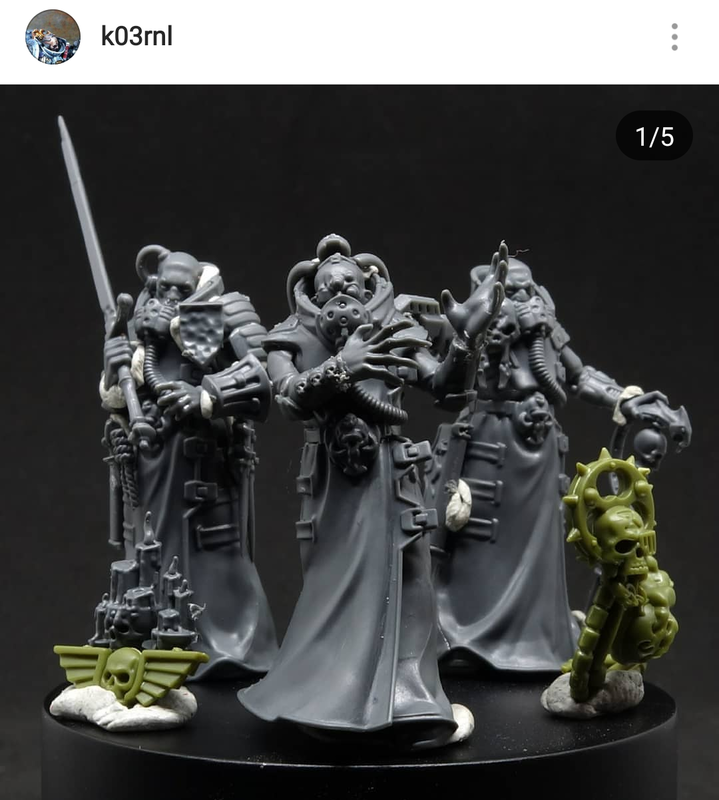 Due to this, there is no way we could list all of the people who created excellent models. Instead, we are going to focus on a few hobbyists that really inspired us to keep creating models throughout the year! 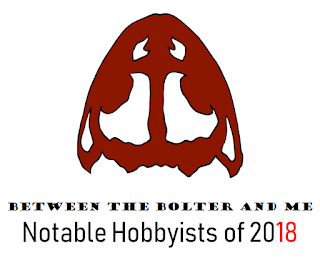 If you do not see someone on the list that you feel should be, we encourage you to look at some of our previous years (2017, 2016, 2015, 2014), as we have featured many fantastic hobbyists over the years, many of whom are still producing excellent work! 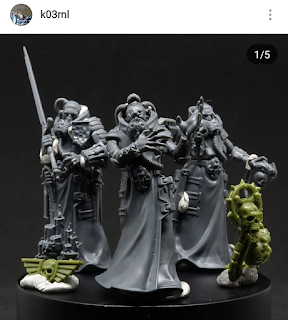 If there is one person that epitomizes kitbashing in this hobby today, it is Christof Keil. His Instagram account is filled with a impressive array of diverse and ambitious conversions, that splice together all manner of different model kits. He has an incredible talent of being able to look at a piece of artwork and devise a method of creating a model of it. 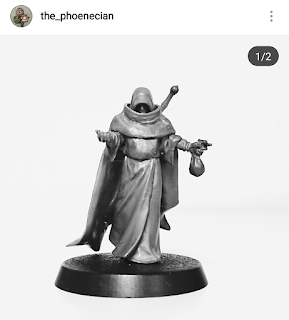 He built wonderful 28mm renditions of all of the main characters introduced in the 54mm Inquisitor game. 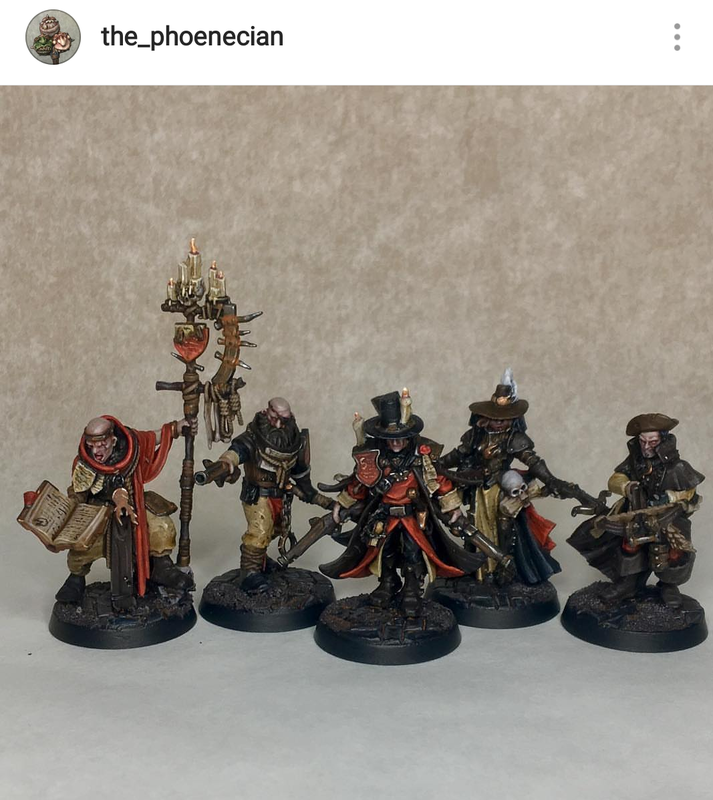 This creative endeavor is made even more staggering when you learn that they were all completed within a single month of furious building and painting. Never one to rest on his laurels, he constantly experiments with new painting and conversion techniques. 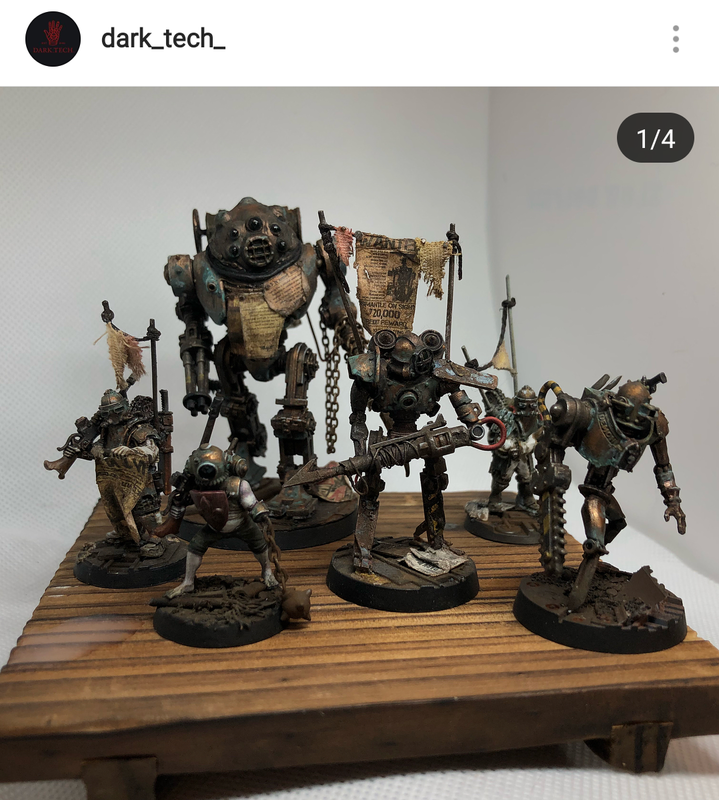 Importantly, he shares all of this first-hand on live Instagram streams of his hobby sessions, some of which can be found on his YouTube channel. 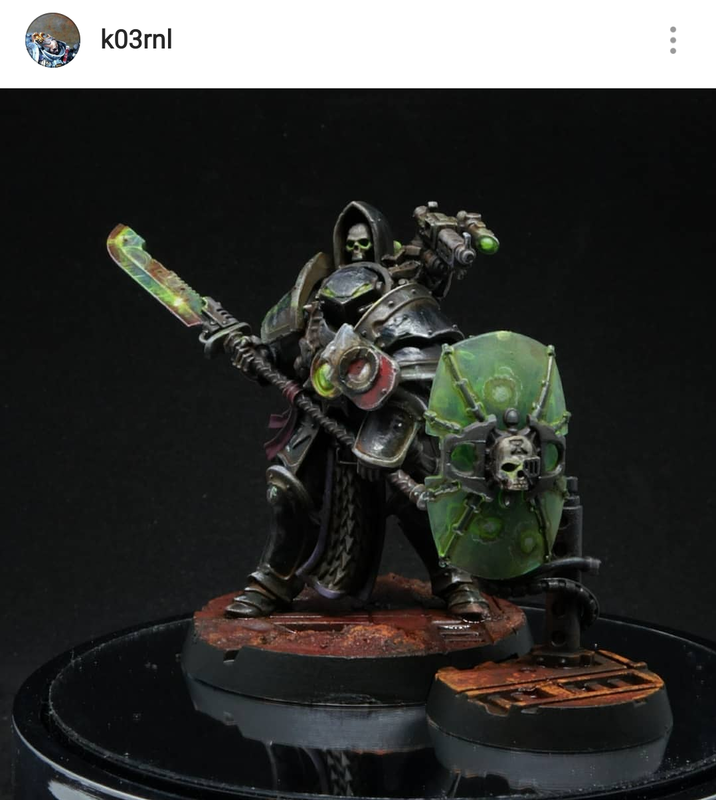 K03rnl’s commitment for sharing his creative process really sets him apart from many other hobbyists, helping make the hobby more accessible to all! So if you don’t already, you should start following him immediately! If there ever was a consistent hobby force in all our time writing for this blog, it is Wilbur Whateley. Over the years he has produced countless wonderful models, all while staying engaged with the wider hobby community with a blog, an Instagram account, and a lively Twitter presence. 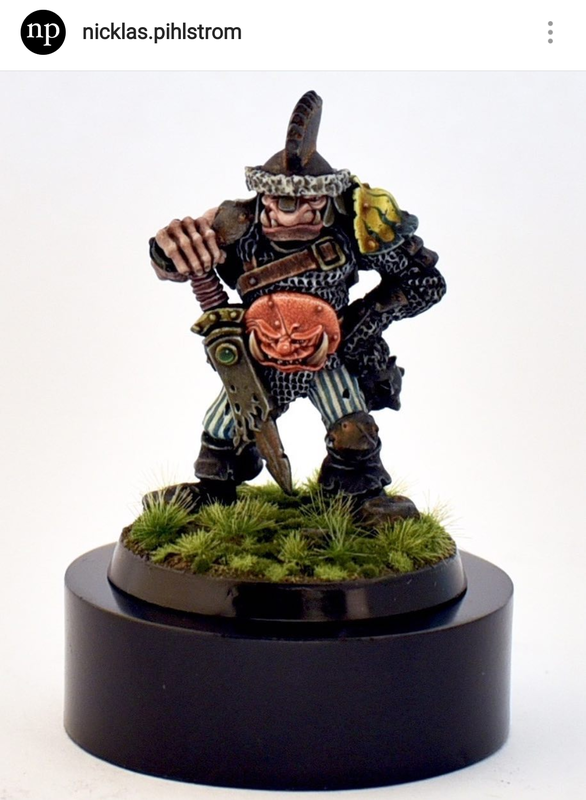 Over the course of this year Wilbur has created a wonderful range of fantasy-themed models focusing heavily on the followers of Chaos, whether a lightning-infused shaggoth or a maddened Blood Bowl beastman. He has an incredible knack of working together pieces from all manner of ranges to create the most noxious nurgle models you have ever seen, conversions so seamless that they look just like an official GW build. 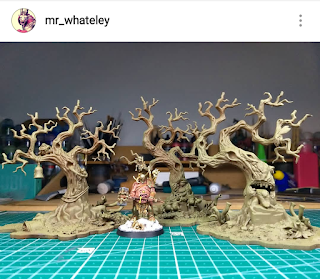 One of our favorites this year was his converted grove of nurgle infused trees (who wouldn’t want those infernal constructs to take root on their gaming table). 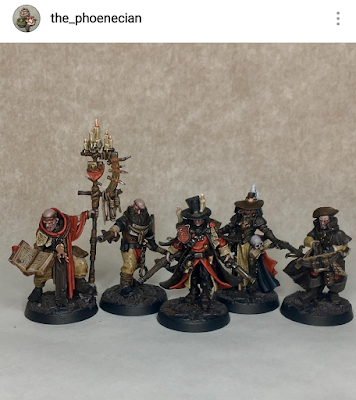 Similar to how we operate on our blog, he is not shy to post work in progress pictures of his models, which helps people see his conversion process and allows time to get feedback from the community. Furthermore, as a practicing hand therapist, he has written a few posts trying to raise awareness of taking care of your hands to avoid the development of cramps and chronic pain. 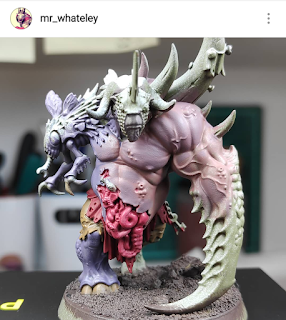 Follow Wilbur to not only see some awesome models but to learn about keeping your hands in working order so you can keep making and painting cool models, as well! While once primarily reserved for scale models (tanks, planes, etc. 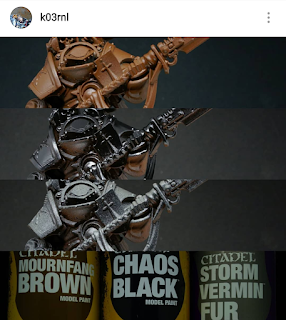 ), weathering and texture are increasingly being utilized in this miniature hobby. Nowhere is this more evident or expertly achieved than in the creations of dark_tech_. His unique vision of the 41st millenium is characterized by rust and grime, destitute pilgrims, and clockwork automations driven by sheer malevolence and a lust for violence. This is epitomized in his collaborative project and setting Mare Solum. 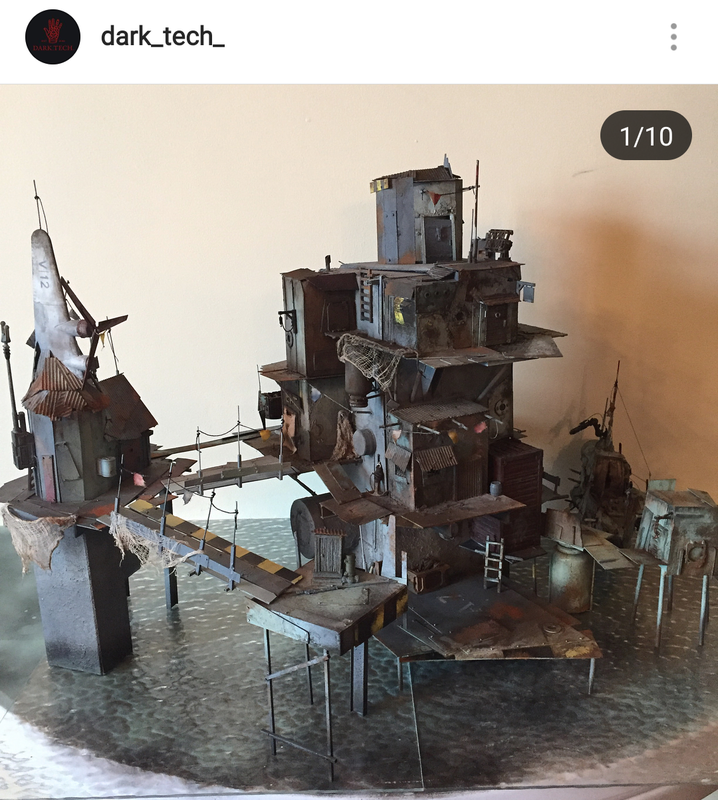 He built a stunning gaming board that consists of a corroded shanty town suspended over turbulent waters by rusty stilts. Not stopping there, he created a series of imaginative and piecemeal floating barges and and other aircraft that fit right alongside the town itself. Everything is covered in tattered parchments and strung with threadbare pennants, and it is all painted to look as though it has suffered from long years of exposure to harsh maritime winds. If you want to get lost in curious and imaginative narratives that stretch the boundaries of the 40k setting, we urge you to take some time to look at the creations of dark_tech_. 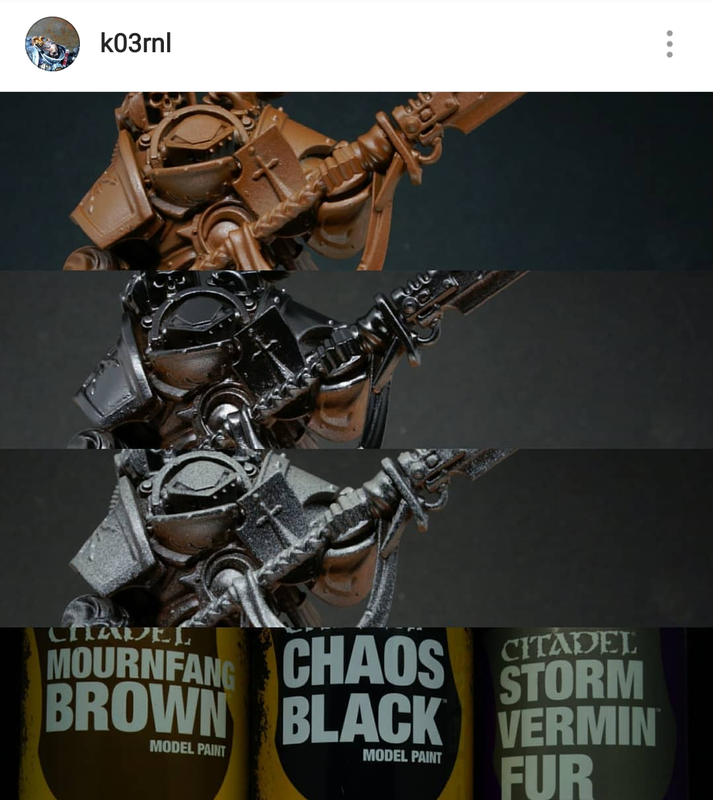 It is objectively hard to argue with the fact that the quality of Games Workshop’s miniatures have risen dramatically within the last 10 years. 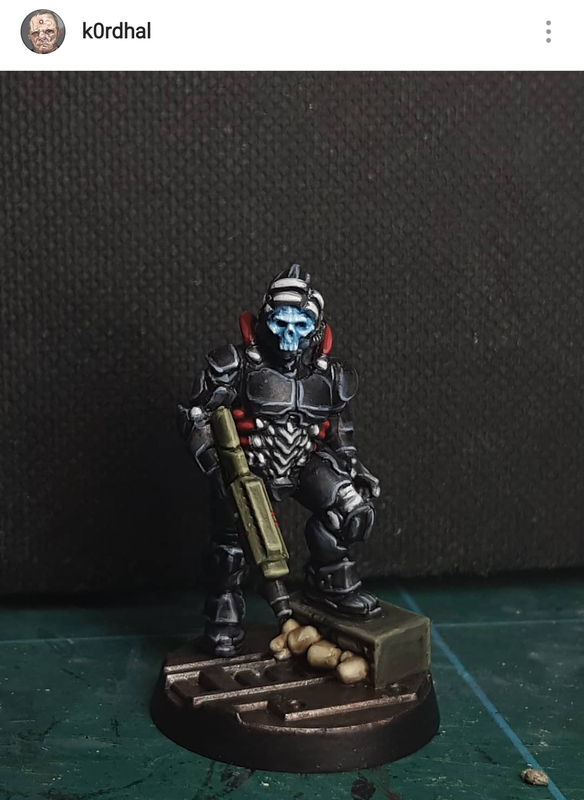 The advent of digital sculpting and better molding technologies has allowed for models that are more dynamic and finely detailed than the single piece metal models of the late 80’s and 90’s. But for anyone who has been in this hobby for a long time, you have fond memories of those old models that first captured your imagination. Nicklas Pihlström, one of our favorite miniature painters, clearly has a love of classic miniatures and puts his prodigious talents for painting and converting towards modernizing old models. 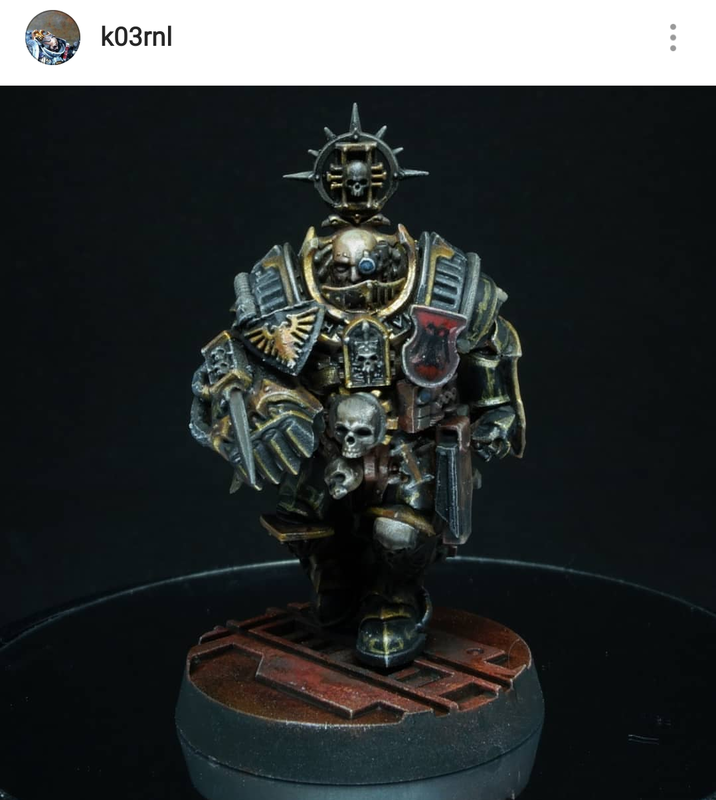 In many cases, he is able to do this simply by painting the models with more contemporary techniques. He is a master at conveying texture with his painting, from cracked and worn leather, to dusty rough woven robes, to pustulant and sickly boils, he is able to meld each into a single model. His skill at replicating the variegated tones seen in real skin is remarkable, adding depth and contrast to all of models. 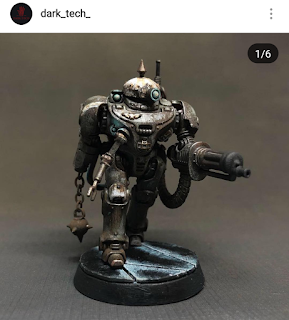 He also has a great appreciation of how effective weathering can really sell a model, be it rusting plate mail or flecking paint on a well used chain blade. Amazingly, he has even found a way to revive the spirit of the old Goblin Green bases that were ubiquitous in the early 90’s. He achieves this by intricately crafting bases by applying static grass and tuffs, as well as delicate ferns and flowers. 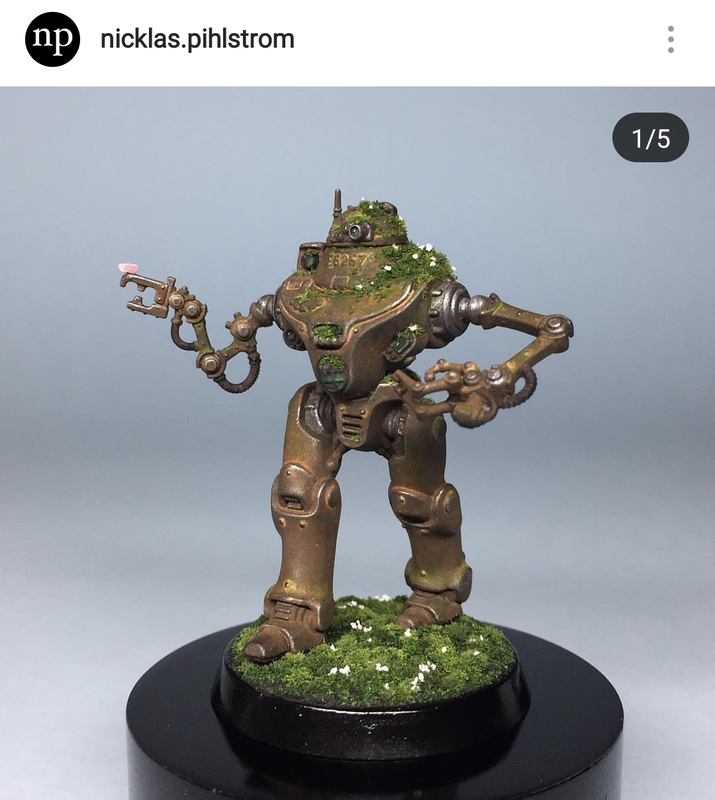 These beautiful creations contrast his grim models with lush vegetation that reminds us not every model needs to be on rusted industrial walkways. Aside from paintwork, he is skilled at converting and has a careful eye for how he can utilize new plastic components to completely re-envision a model. On top of this, he takes many influences and techniques from scale modeling to augment his conversions, including replacing gun barrels with brass tubing and floor grating with brass photoetch. 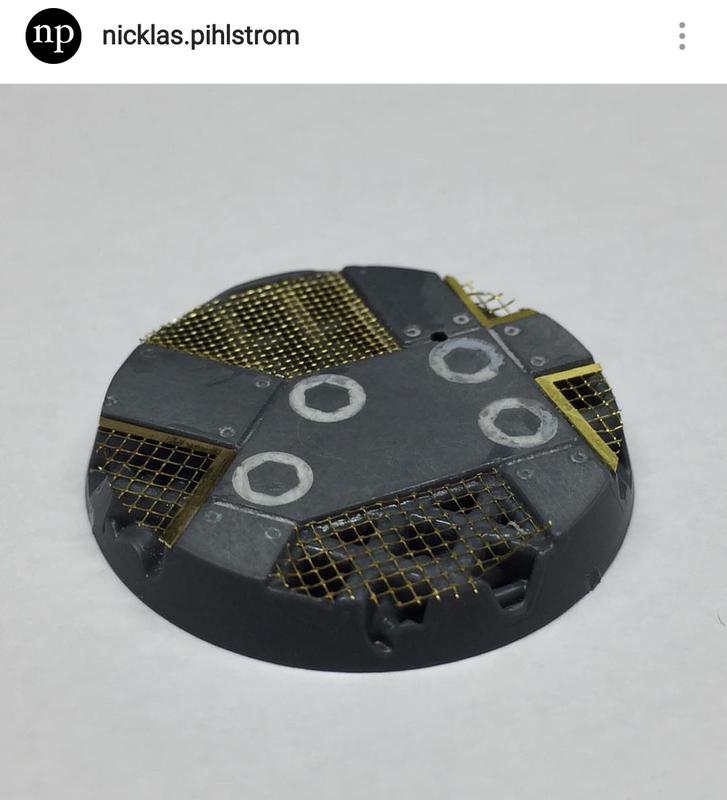 Probably more than any of the other hobbyists on this list, Nicklas Pihlström has encouraged us to improve our craft by experimenting with new materials and techniques. 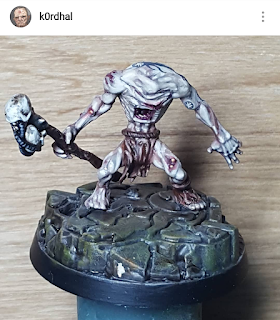 While models are an integral part of this hobby, what has truly kept us invested in it for so many years is the setting and the narrative threads that weave between everything, investing emotion and personalities into every figure. 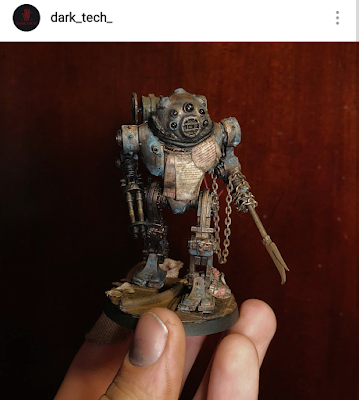 Nicholas Tregidgo, who goes by k0rdhal, recognizes this and makes it a integral part of his miniature creation process. Not content with simply building an intricately detailed model, with a sharp consideration to proportions and pose, he also writes a piece of narrative to accompany each. 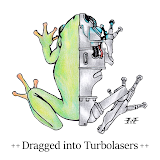 These are sometimes as short at a sentence, but they always provide tantalizing clues to the characters he creates, grounding them to the setting and hinting at their personal struggles and triumphs. By keeping these descriptions short and enigmatic, he tacitly encourages the onlooker to invest a little of themselves in the model, spinning the narrative a little further, letting it drift wherever the mind wanders. 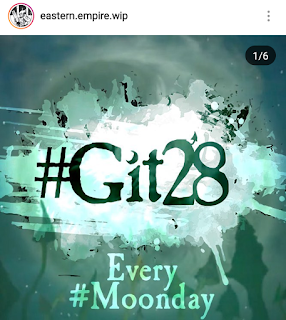 And as we all know, a mind without purpose will wander in dark places… This sort of celebration of storytelling also serves as an encouragement for us all to consider the lives of the characters we create, and in turn create more compelling models. K0rdhal’s talents do not just lie in his aforementioned writing. 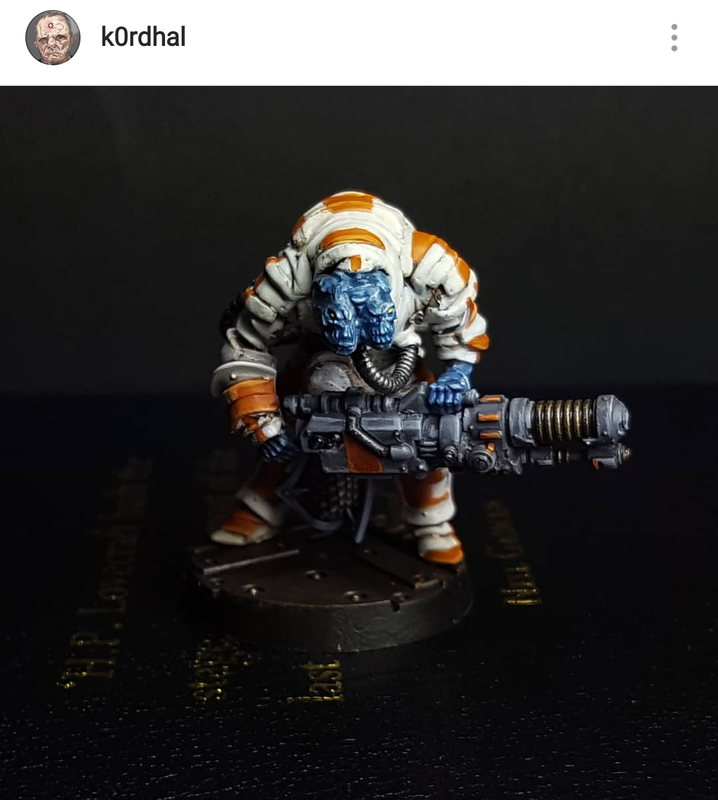 He also has formidable talent with green stuff, a careful eye for splicing models together, and an interest in exploring things outside the realm of the Imperium of Man, such as creating awesome xenos species! If you are not following his work already, you owe it to yourself to check it out! 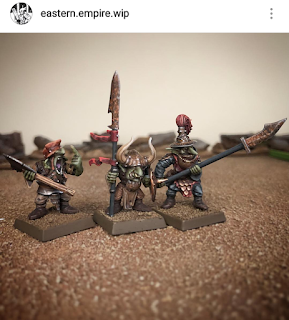 While most of our efforts at Between the Bolter and Me go towards building human characters, we have always had a soft spot for greenskins, so it is always a pleasure to see all of the great work Sebastian Stuart does with his goblin horde. 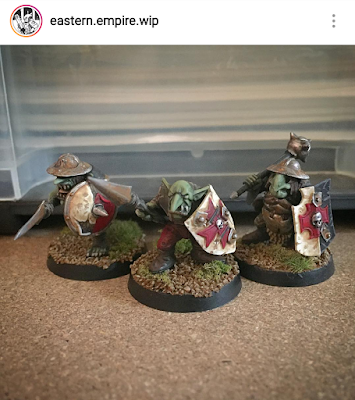 What started out as a few goblins for Warhammer Quest eventually became an entire army (because one can never have too many goblins). 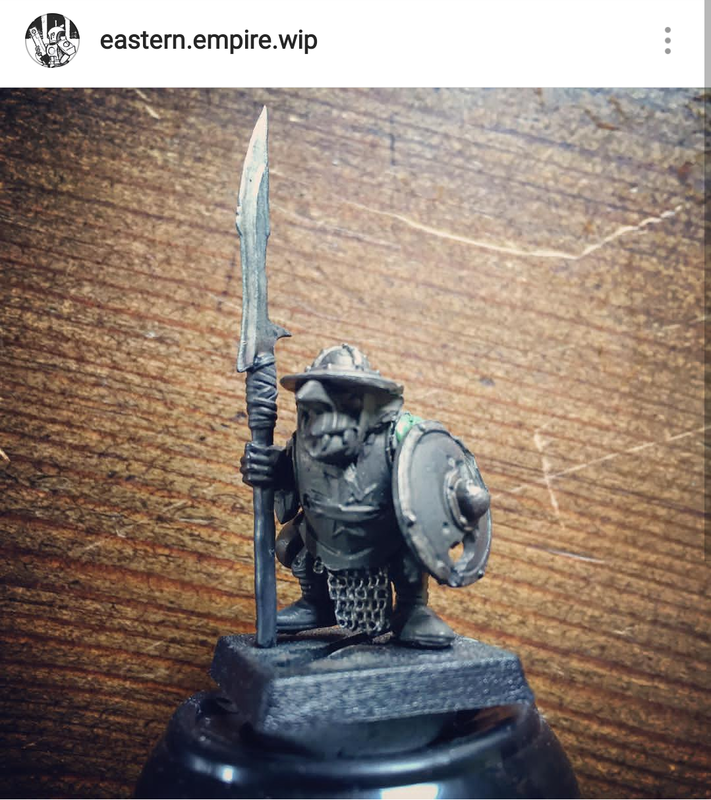 He has a remarkable ability to splice together a wide assortment of kits seamlessly to make scores of unique goblins. 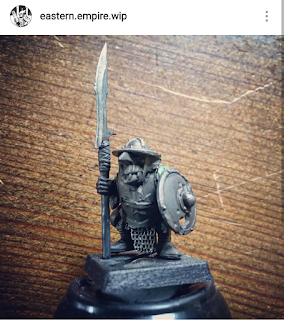 And he does not limit himself to goblin kits, utilizing pieces from the Empire, Bretonian, Skaven, and Lord of the Rings ranges, ensuring that no two goblins look the same. 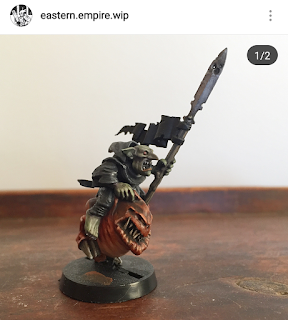 His goblin conversions are so convincing that without looking carefully, you might think that they were not conversions at all, and came directly from one of the goblin model kits. 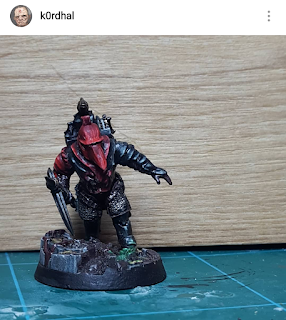 For what is traditionally a horde army, Sebastian is able to make nearly every goblin feel like they are their own character, someone you would like to hear about their exploits. Fortunately for us, he has given names and backgrounds to quite a few. 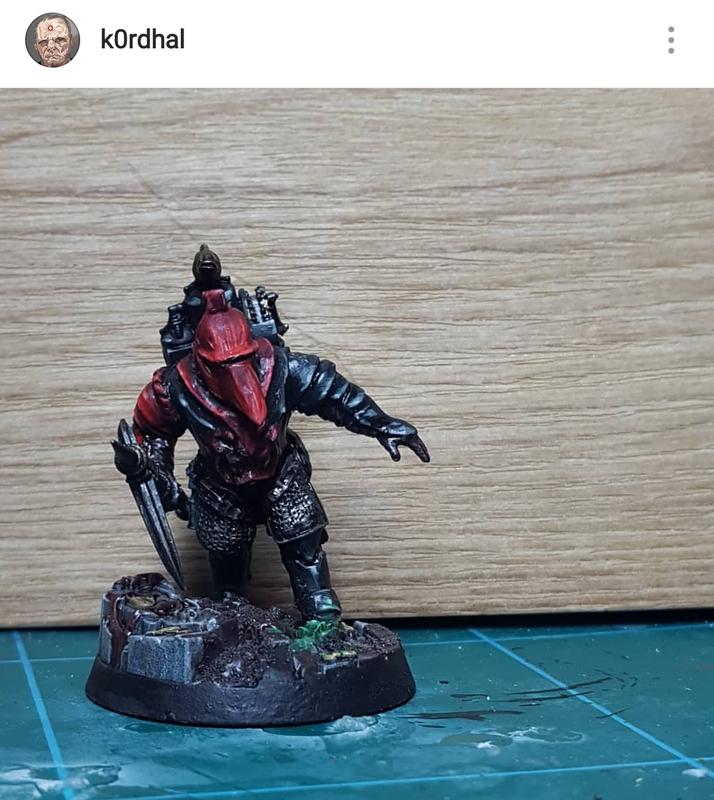 Like Pots, the failed shaman who now brews fungus ale for the gits and the Night Goblin Boss Skrix with his prosthetic blade nose! 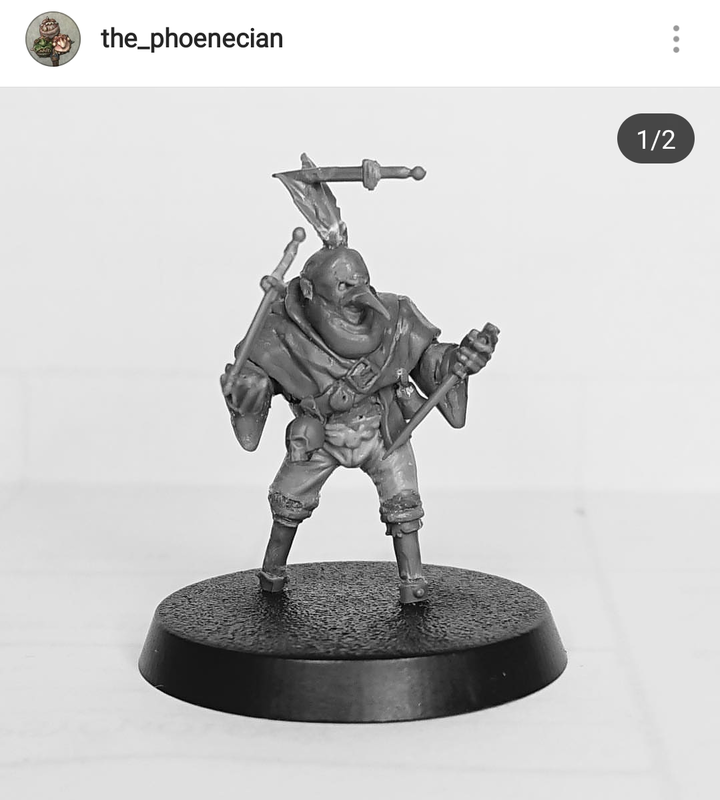 We are excited to see what he will do with some of the new models that were recently released for the Age of Sigmar goblin range. It is as if he foresaw the release of the Goblin Knights, as he build his own knightly goblin riding a squig in 2017! 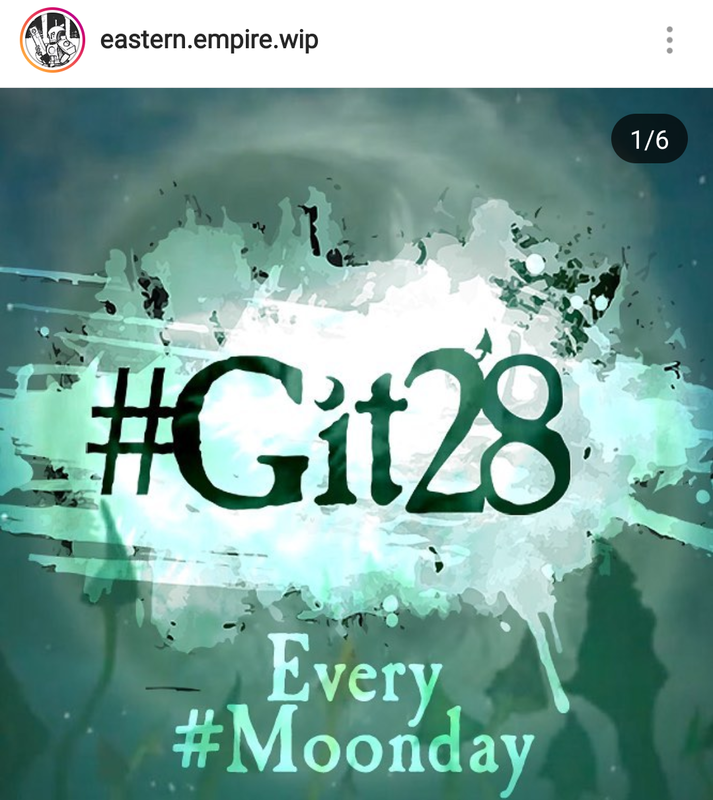 What’s more, to get other hobbyists excited about goblins, he has started the #Git28 initiative to get people to post images of their own completed goblin models every Moonday (Monday). As if his work with goblins was not enough, he is a tireless champion of the original Warhammer Quest, and has been designing and releasing his own map tiles for the game and distributing them free of charge! 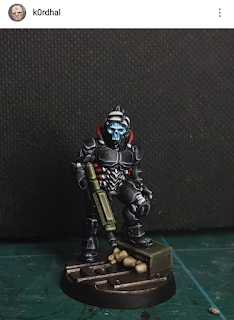 Goblins are not his only love, as Sebastian has been maintaining a website dedicated to the Space Marine chapter The Scythes of the Emperor since 1997 (the year the three of us started playing Warhammer 40,000)! We feel somewhat remiss at having only discovered the work of Jimmy Henriksson, the_phoenecian, at the end of 2018 due to a wonderful Witch Hunter warband for Mordheim. 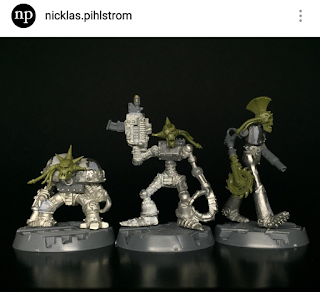 Few hobbyists so deftly combine the skill of kitbashing with sculpting as Henriksson. He has an impressive ability of recognizing where a plastic piece will suffice, and where green stuff would be better served. A quick glance at his Instagram account will reveal all manner of awesome models, many of which it is hard to place what models the conversions were based on, such is his skill at the craft. 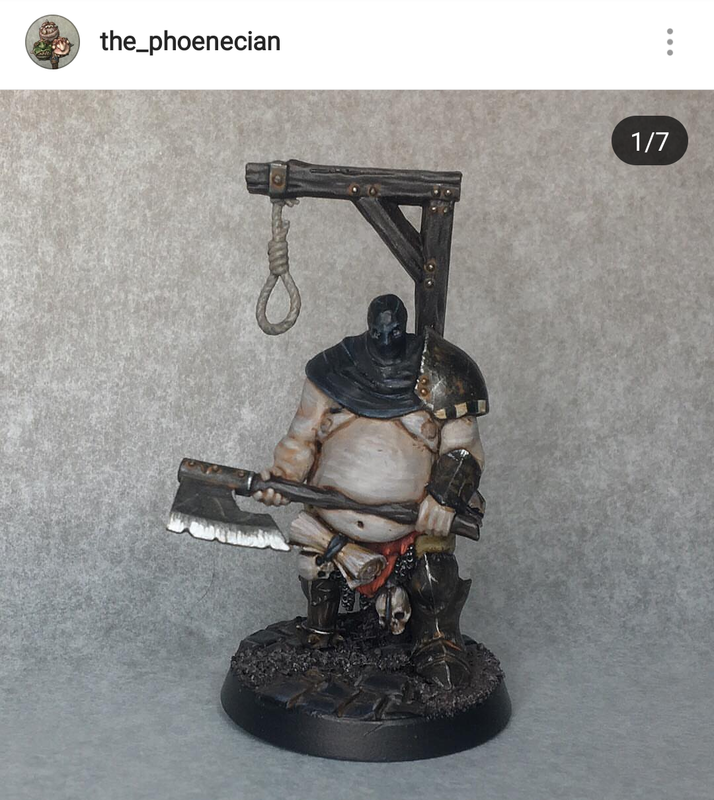 Recently he has taken to converting many of the crazy characters that grace the pages of the Mordheim rulebook, including the iconic hooded wanderer and John Wigley’s odious knife juggler. Just the sight of them is sure bring a smile to any fans of Games Workshop’s old skirmish game, and stir some nostalgic memories. We cannot wait to see what he continues to create in 2019; we imagine the best is yet to come! Thanks for taking the time to read this post; we hope you found an new hobbyist or two to follow! Yeah, they are all wonderful! Thank you guys. Very honoured! We are really happy to include you on this list! You have been a constant source of inspiration and helpful, honest critques. Thanks! 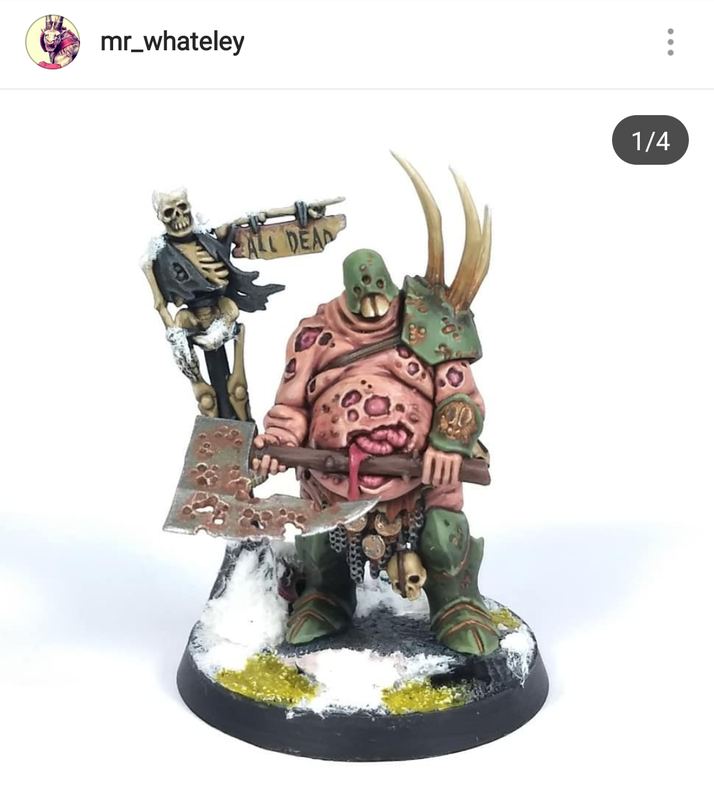 This post every year is my favorite, because it celebrates the community, which is so integral to the hobby. Always a pleasure to see these guys' work appear on Instagram. Nicklas' beautiful bases made me spend a fortune on flock and tufts! He he, I have also spent quite a lot on them too now! A good list, thanks for drawing our attention to some excellent hobbyists...I do not think you will be surprised to find that I love Nicklas Pihlström's work and have been following him for a while on instagram, and on Ammobunker before that! Yeah, Pihlström's models are fantastic. 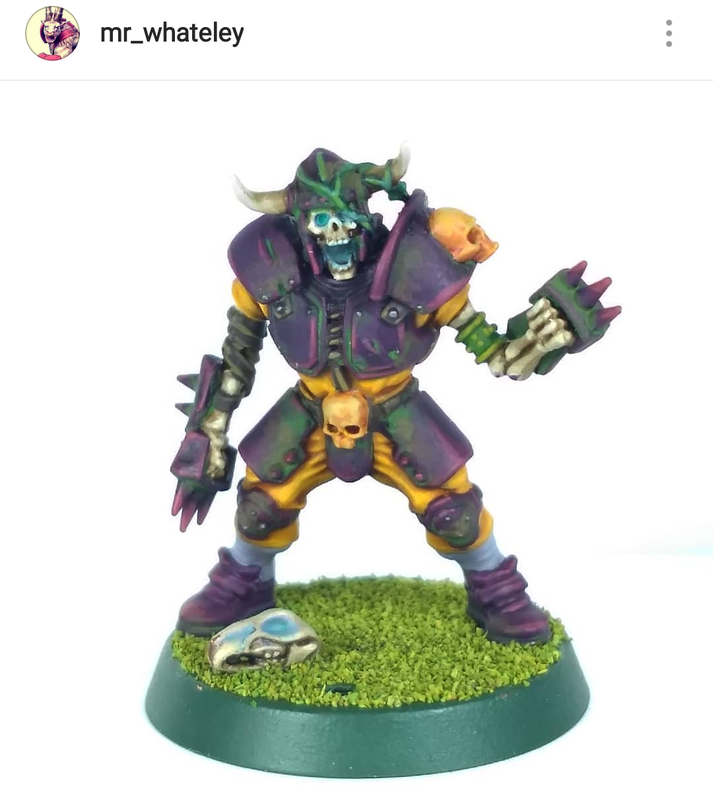 He really has an eye for detail and color.